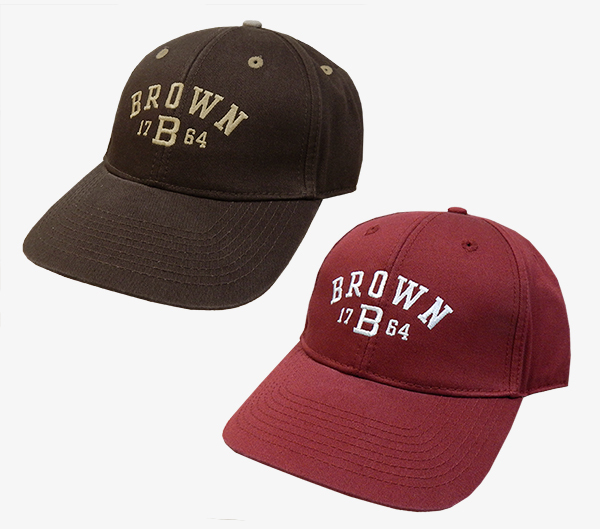 47 Twins brown adjustable cap with 'BROWN' embroidered in raised red letters with white outline. 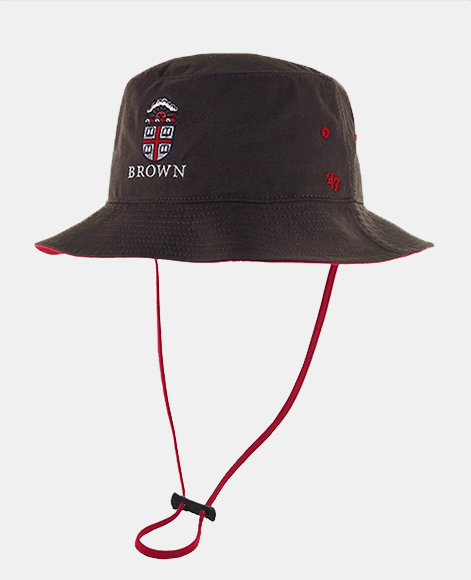 47 Brand brown twill bucket hat with cardinal embroidered vent holes, cardinal under brim, and adjustable cardinal chin strap. Embroidered grey, cardinal, black, white, and bronze Crest above 'BROWN' embroidered in white on front and '47 embroidered in cardinal on left side. One size. 47 Brand brown 51% cotton, 49% recycled polyester fitted cap with embroidered gold, red, white, and black sun and clouds above raised embroidered cardinal, grey, black, and white crest above 'BROWN' embroidered in red. 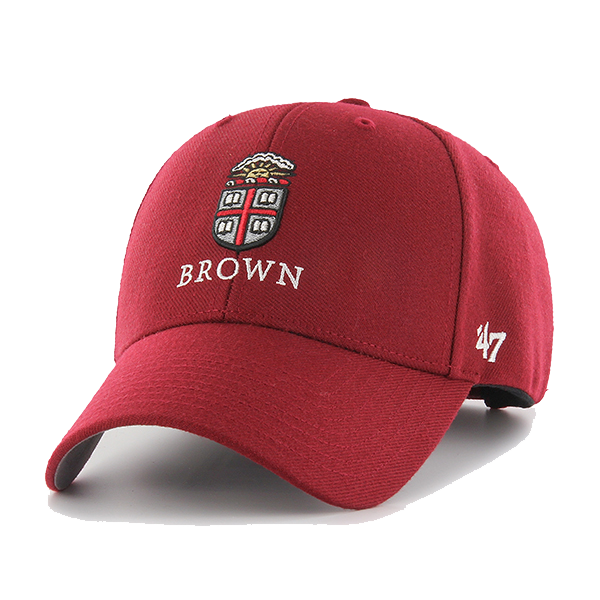 '47 embroidered in white on front-left side of cap and 'BROWN' stitched in red with white and brown outline on back of cap. This hat is made from approximately two 20 oz. recycled plastic bottles. 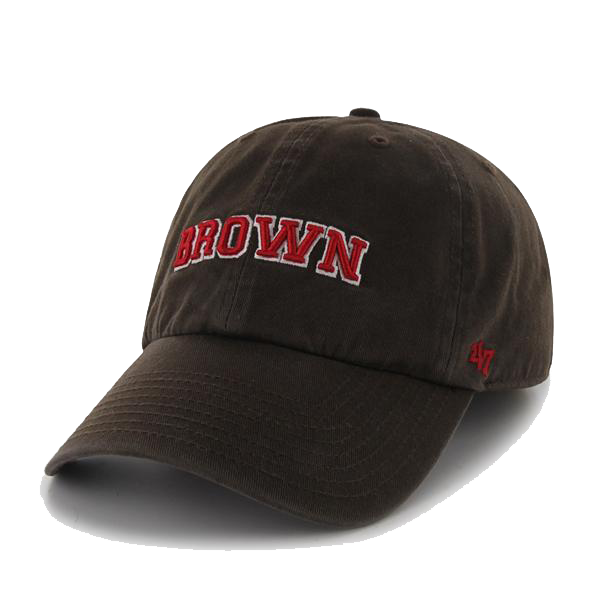 Please select option for 47 Brand Brown Crest Fitted Cap - $29.99. 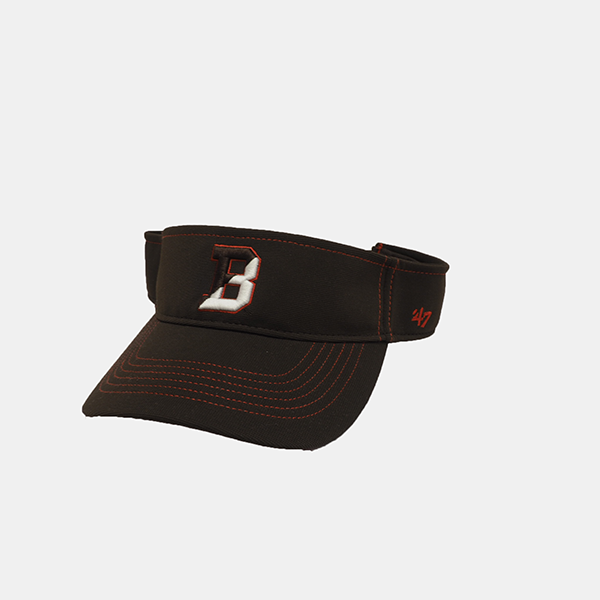 47 Brand 94% polyester, 6% spandex brown colored visor with red stitching. 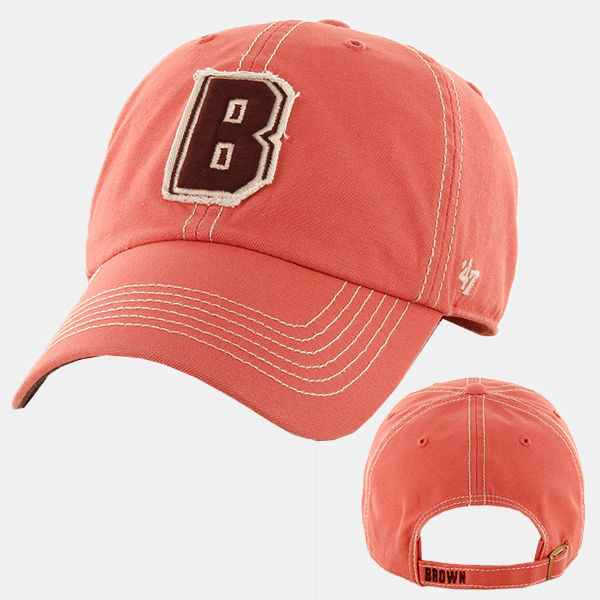 'B' embroidered in brown and white with red outline, '47' logo on left side in red, and 'BROWN' embroidered on back strap in brown lettering with white outline. 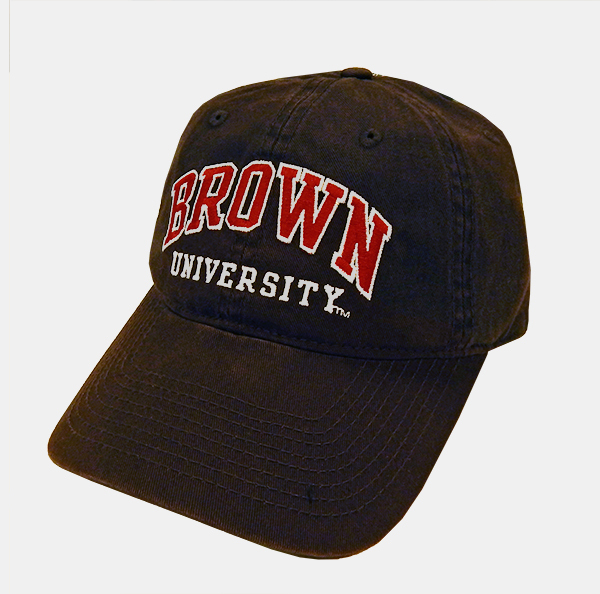 47 Brand stretch-fit, 94% polyester, 6% spandex brown cap with red stitching on bill of cap. 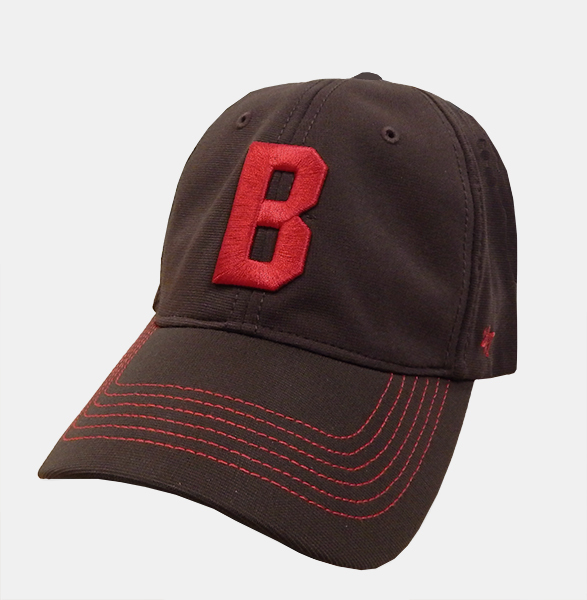 Raised cardinal embroidered 'B' on front with '47 embroidered in cardinal on left side and 'BROWN' embroidered in cardinal with white and black stitched outline on back of cap. 47 Brand 82% acrylic, 15% wool, 3% spandex, adjustable snapback, brown flat bill cap with 'BROWN' in cardinal raised embroidery with white and black embroidered outlines on front, grey, cardinal, brown, black, and white embroidered Crest on right side, and '47 embroidered in cardinal on left side (not shown). 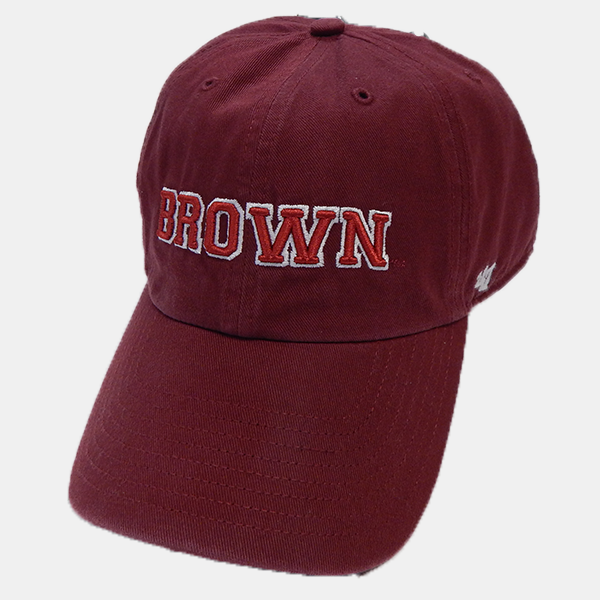 47 Brand, 100% cotton, cardinal adjustable cap with raised 'BROWN' lettering in cardinal with white outline. 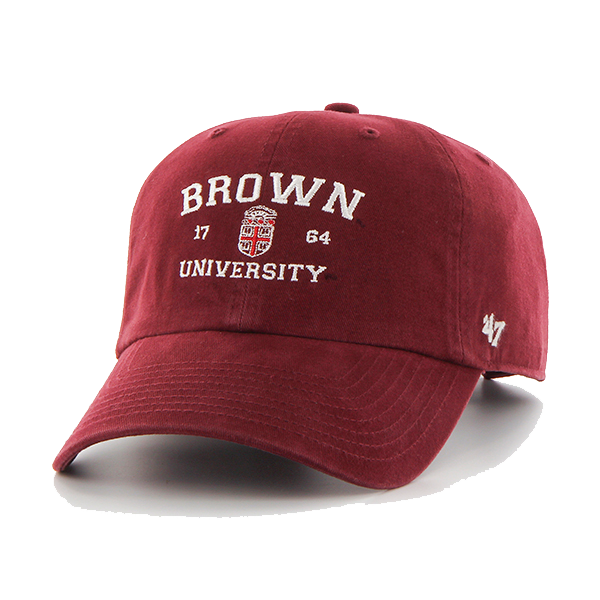 47 Brand adjustable, one-size, faded red cap with white stitching has sewn-pn raised embroidered brown 'B' with white and brown embroidered outline on raw-edge fabric backing, '47 embroidered in white on left side, and 'BROWN' embroidered in brown on back of hat. 47 Brand, Material 1: 94% polyester, 6% spandex; Material 2: 100% polyester. 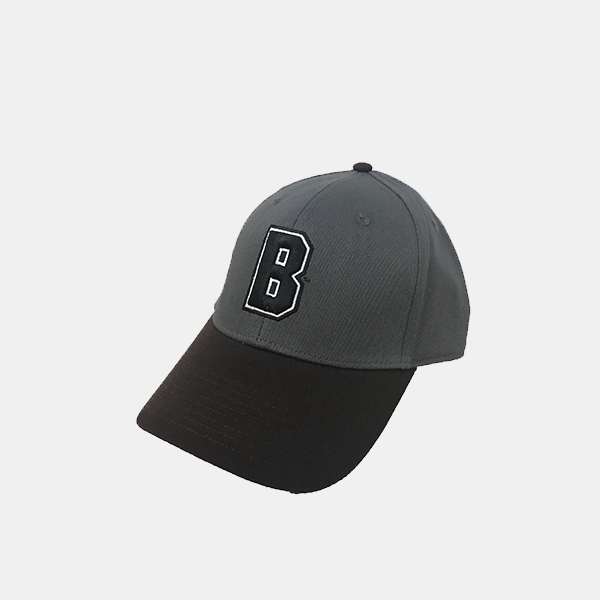 Velcro-adjustable cap with black under bill. Raised Brown Bear embroidered in brown above 'BROWN' embroidered in brown lettering with white outline. Raised '47' embroidered on left side in white, 'BEARS' embroidered in white on right side. 'EST. 1764' embroidered in white on back velcro closure (not shown). 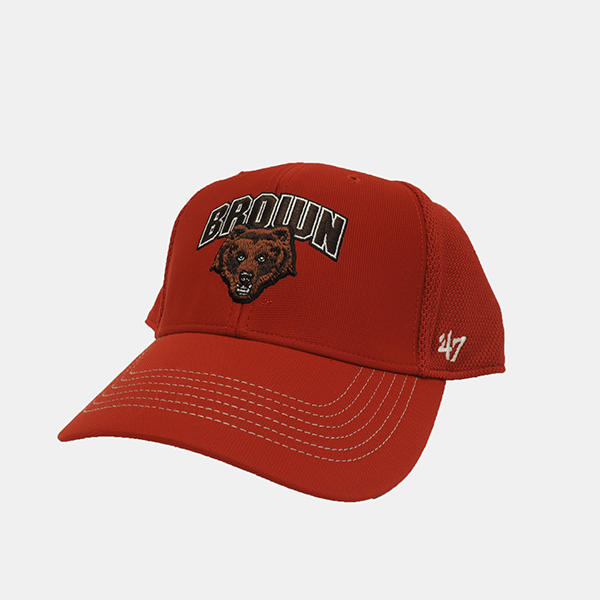 47 Twins adjustable brown cap with 'BROWN' embroidered in off-white, Paw embroidered in brown and off-white with red outline, and 'University' embroidered in red cursive lettering. 'EST. 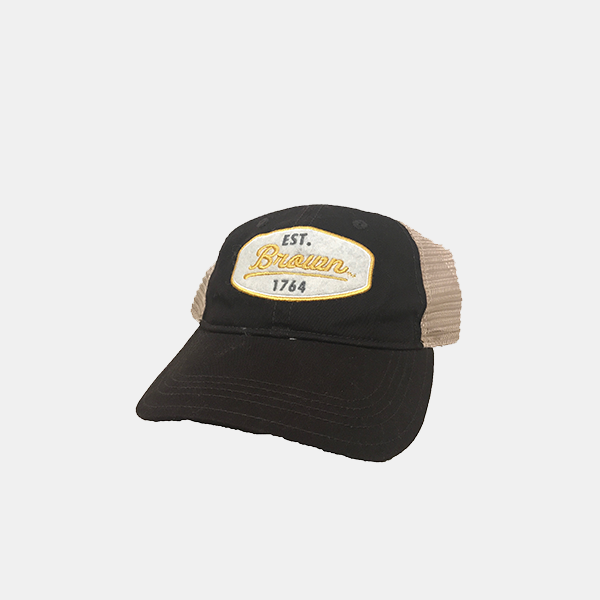 1764' embroidered in off-white block lettering on back. Champion fitted black men's cap. Ivy 'B' logo imprinted on front in gold, 'BROWN' embroidered on right side in white. Crest in cardinal, grey, gold, and white on back. 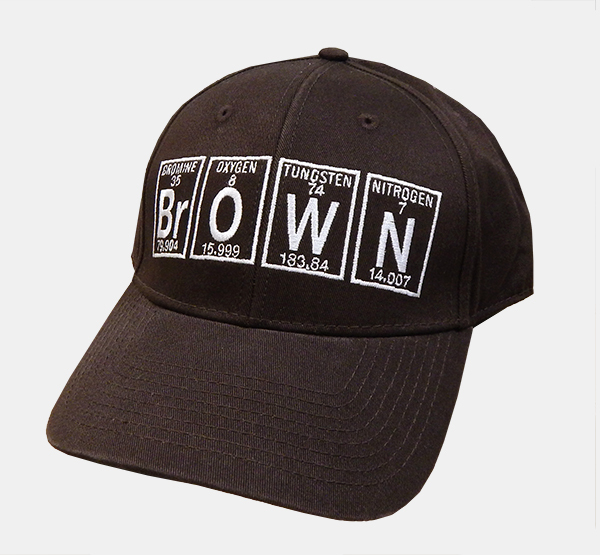 Champion adjustable, 100% cotton twill brown cap with Brown embroidered in white in the elements of the periodic table: Br = Bromine, O = Oxygen, W = Tungsten, and N = Nitrogen. 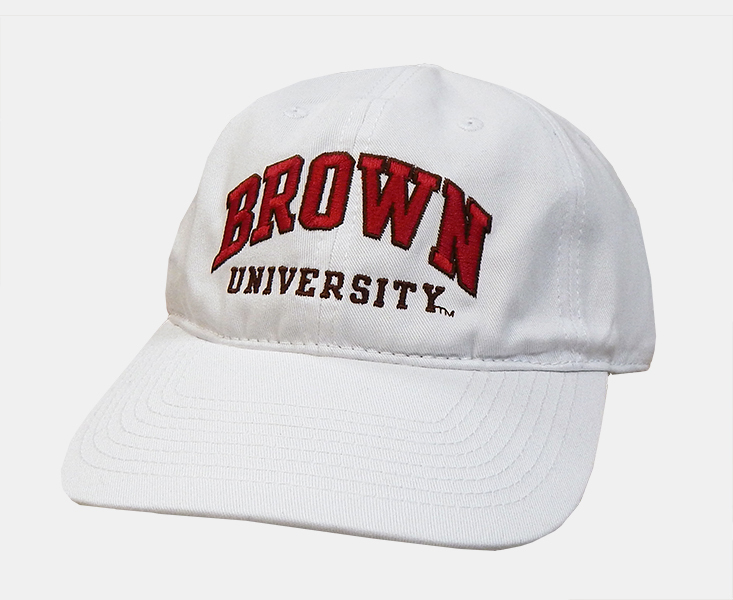 Champion 100% cotton twill, adjustable brown cap with 'BROWN' embroidered in cardinal with white embroidered outline above 'UNIVERSITY' embroidered in white. Champion adjustable brown cap with mesh backing. White patch embroidered in front with yellow outline, 'EST.' in silver above 'BROWN' in yellow script and '1764' at bottom in silver. 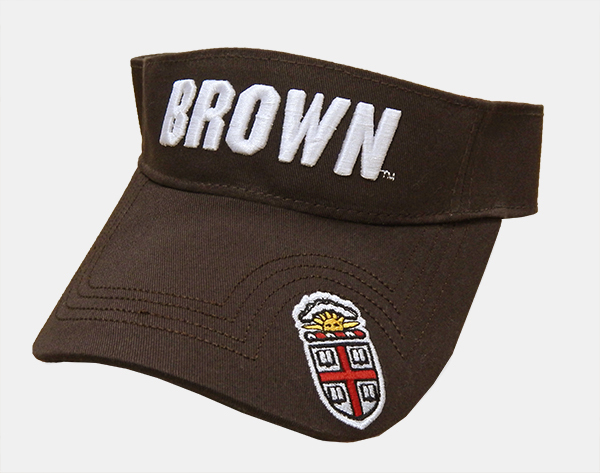 Champion 100% cotton, velcro-adjustable, brown visor with 'BROWN' in raised embroidered letters and embroidered cardinal, black, white, and gold Crest on left side of bill and Champion symbol embroidered in white on back. 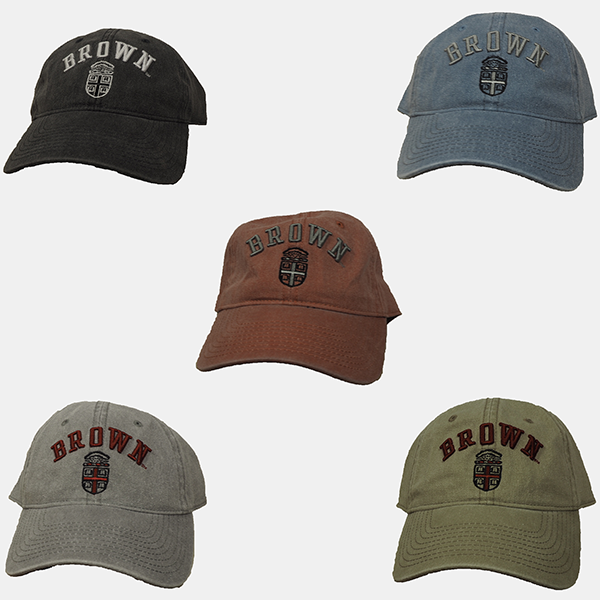 Champion 100% cotton twill, adjustable caps with 'BROWN' above '17' next to 'B' next to '64' embroidered on front of cap. 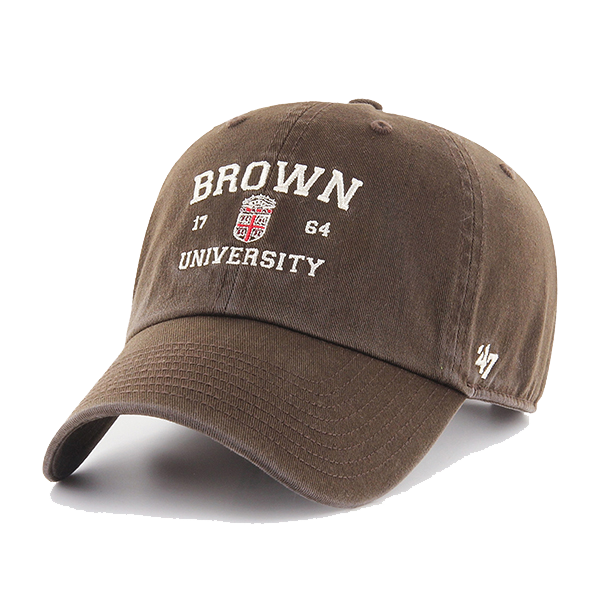 --Brown Cap has light brown embroidery with light brown embroidered vent holes. 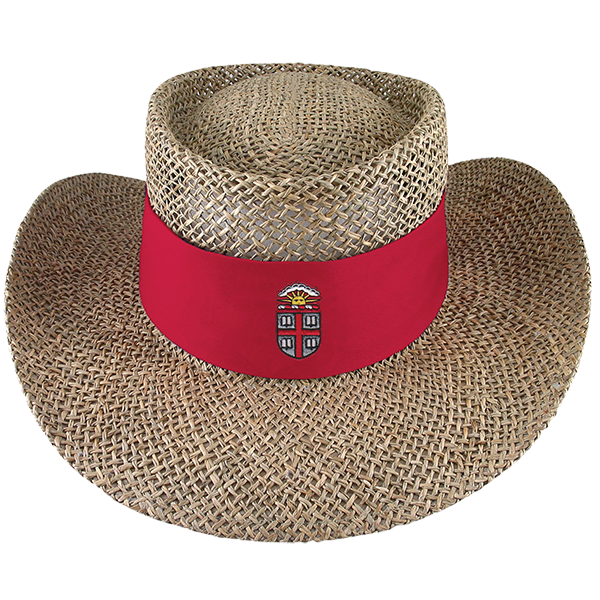 --Cardinal Cap has white embroidery. 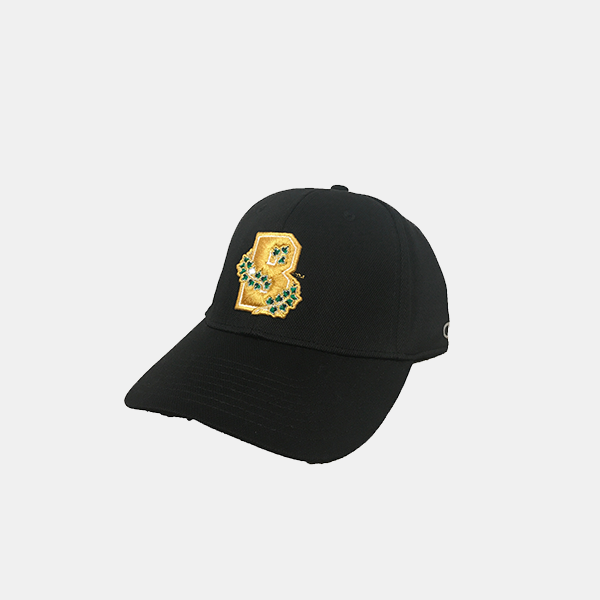 Please select option for Champion Established Caps - $19.99. Champion, pigment dyed cap with 'BROWN' embroidered above Crest. Available in Blue Jean, Red, Black, Dark Khaki, and Gray. Please select option for Champion Pigment Dyed Cap - $24.99. 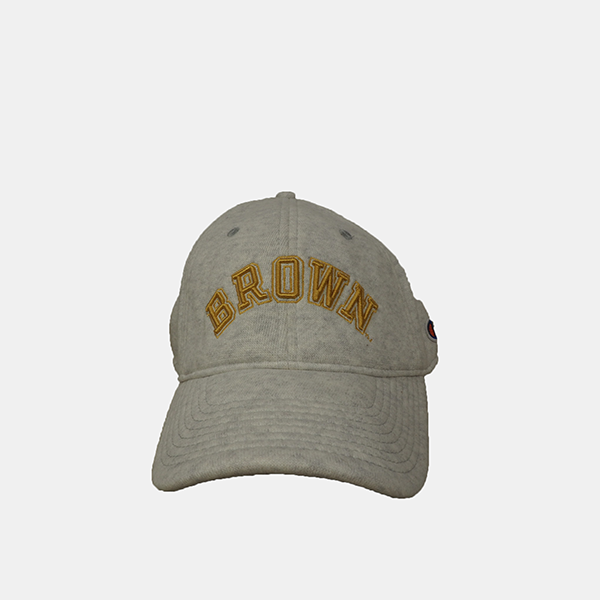 Champion, silver/white cap with 'BROWN' embroidered in gold lettering with gold outline. Champion adjustable men's cap. Grey body with brown colored visor. 'B' imprinted in black with white outline at front-center. Champion 100% cotton twill, adjustable white cap with vent embroidered white vent holes. 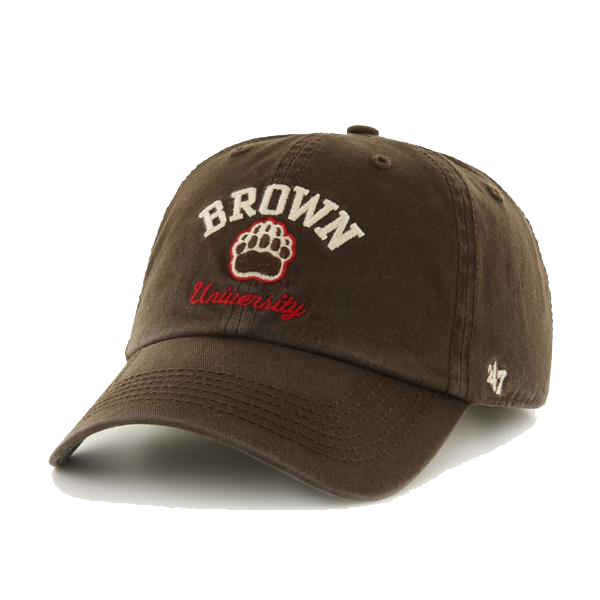 'BROWN' embroidered in cardinal with brown embroidered outline above 'UNIVERSITY' embroidered in brown. 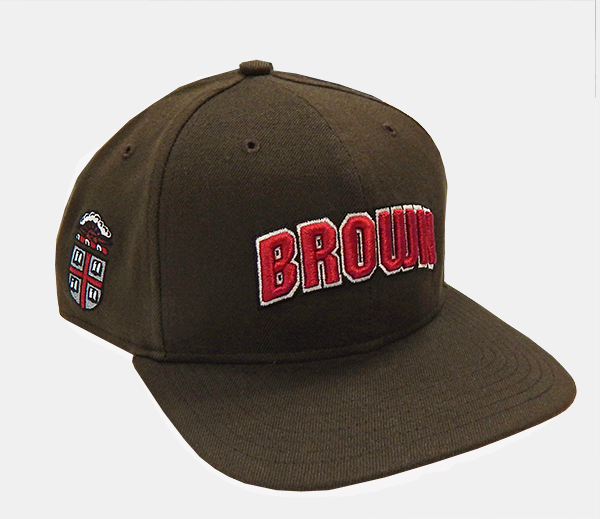 Legacy adjustable brown twill cap with "Brown Alpert Medical School" and crest embroidered on cap. 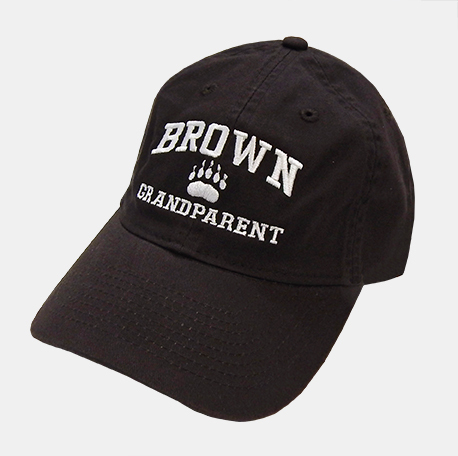 Legacy adjustable, relaxed brown twill cap with 'BROWN' embroidered in white above white embroidered Paw above 'GRANDPARENT' embroidered in white. 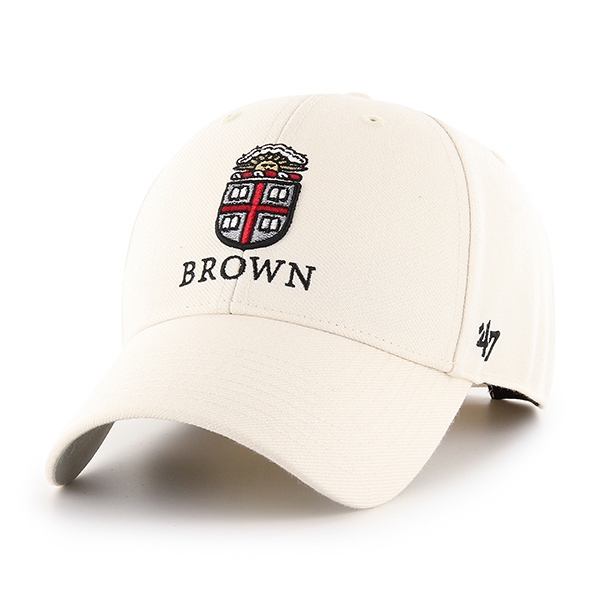 Legacy brown twill adjustable-back cap with 'BROWN,' sports graphic, and text embroidered in white. 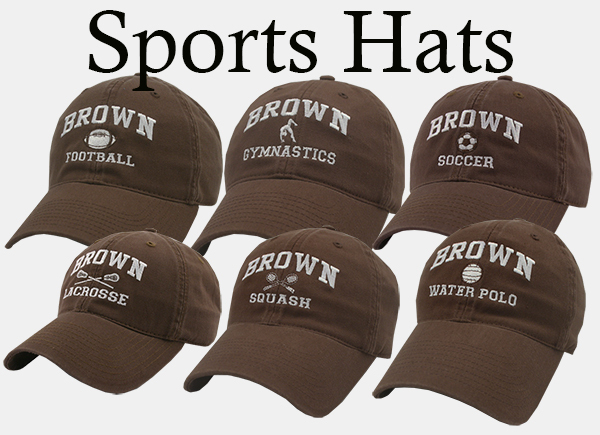 Please select option for Legacy Brown Sports Caps - $21.99 & $24.99. 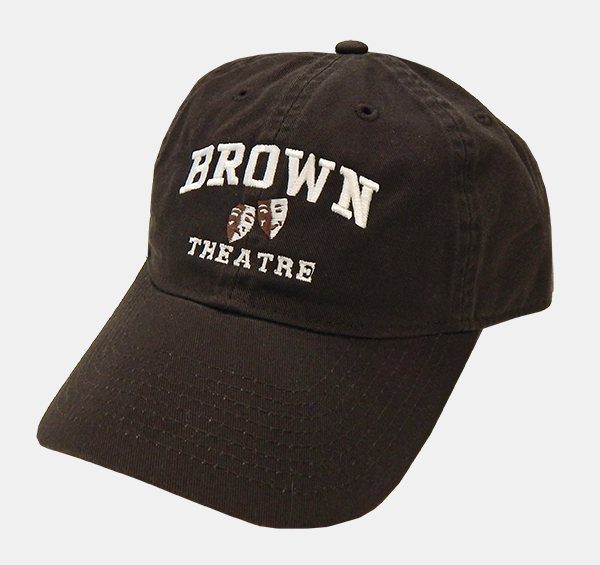 Legacy 100% cotton twill adjustable brown cap with 'BROWN' embroidered in white above brown and white stitched tragedy and comedy masks above 'THEATRE' embroidered in white. 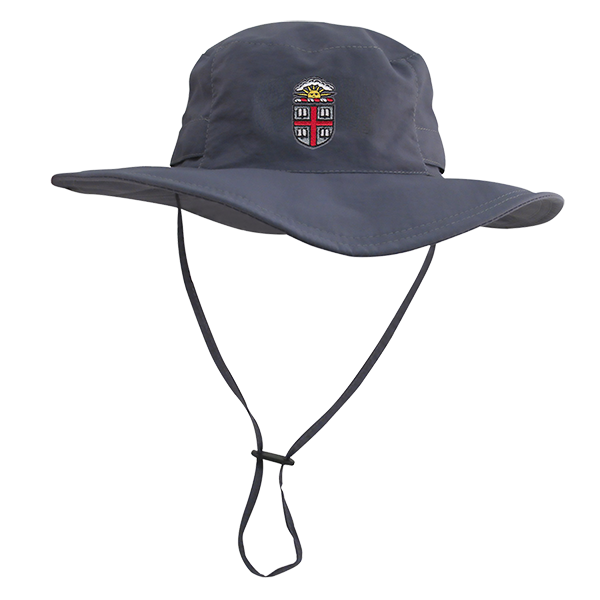 Please select option for Logofit Boonie Bucket Hat - Slate or White. Please select option for Logofit Tournament Sun Hat.